Journal, They can't all be winners. This is simply a memory post: Lauren, do not buy the giant box of Finish gelpacks ever again. You don’t really like them and it is taking forever to get through the box. We only do about 2-3 loads of dishes a week, and there are still 15-20 of them left. *sigh* I usually buy a giant thing of Electrosol tabs from Sam’s Club, but I like how they work. 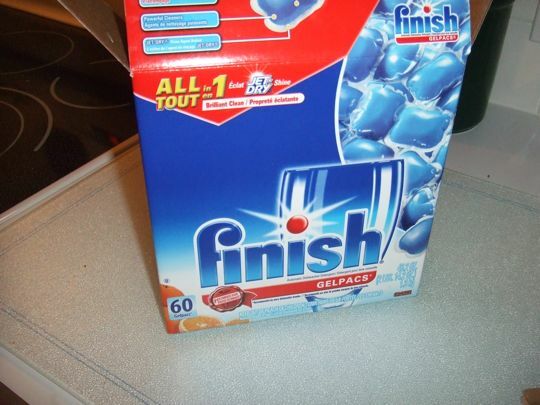 I think “Finish” is the new name for Electrasol brand. Arrrgh! You’re right! I’m still getting the tabs next time. I like how the little Jet Dry ball looks almost like candy. Mmmmm… candy is cleaning my dishes…. Maybe you could use 2-3 gelpacks per load? That would FINISH them off quicker. Have a contest. Step on them & see whose gel shoots the farthest. Light some on fire…remember to record that. Put the rest of them in the basement with the other “Emergency Items”.